Stop the presses! 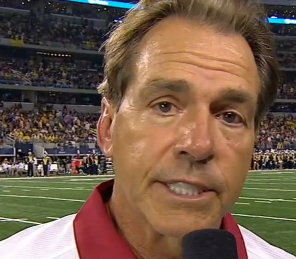 Nick Saban was actually PRAISED for something he did. Saban was praised in the LA Times for being honest about his team’s injury reports. The folks in LA are praising Saban because of one Lane Kiffin. Kiffin got into trouble a few weeks ago for not releasing for kicking reporters out because they released USC’s injury reports. In one of the few times you’ll ever see Saban be complimented for anything, Times reporter Chris Dufresne praised the coach for being honest about his injury situation. To read Chris Dufresne article in the LA Times, check out this link.